If first asked, I would describe my family as something dilute. I picture ink drops in water, which, over time, have spread green and purple fingers out far from one another. What marks us as the same is not location, or even physical appearance, but rather an innate, shared stubbornness, a mile-wide independent streak that has, oft as not, left us a bit in trouble and a bit isolated. This self-containedness, combined with the fact that I have grown up with a Polish-Canadian stepmother, has often made me feel separated from my own geographical origins. While I have known people who speak proudly of their heritage, who instinctively lay claim to the countries of their ancestors, I have rarely reflected on my own identity in the context of nationhood. For me, family has always been something behavioral and (sometimes) genetic–that is, a unit defined by learned and mimicked behaviors, similar personalities, and similar traits. Even my concept of place–childhood haunts, for example, or vacation spots–has centered around the people I met there. Yet this class, and especially the way physical Ireland, its landscapes, its ruins, its traditions, factors into language, and, by extension, heritage, has made me reflect on my own identity in the context of nationhood. I realize that my Irish origins, just as they colored Yeats’s poetry, have also left threads running through my own life, and that I am perhaps not as independent of nationhood as I first thought. There is, most obviously, my nickname and its Gaelic roots. Rory, generally considered a male name, means “red king”, and is an anglicization of the Gaelic name “Ruaidhr,” the Irish name “Ruar” and the Scottish name “Ruaraidh”. This is no accident; my grandmother on my father’s side was Irish, and I believe the nickname, for all its masculinity, fits the tomboyish aspects of my personality. Moreover, though I gave it little thought at the time, my dad has told me I am “Irish” in my moods, making reference to my tendency to be morose, reflective, and (more than slightly) cynical. Though undoubtedly this statement is an oversimplification of what it means to be Irish, I think it does relate to the poetry we have been reading, as often the lines seem to echo with distant sorrow, with melancholy. Arguably, these are the same emotions that can be evoked by the stark and bare beauty of Ireland’s stony shores. I recall now, too, that as a child I loved watching Riverdance on VCR. For those unfamiliar with the show, it consists mainly of Irish folk music and dance, although the music, besides featuring an Irish folk band, also makes use of electric bass, drums, and horns. While Riverdance was far from the only thing I watched (Spongebob and documentaries on marine biology also made regular appearances), there is a part of me that jumps–if ridiculously–to associate the pull of Riverdance with some innate Irishness. It is that same part of me that would like to somehow equate coastal Maine, one of my favorite vacation spots, with coastal Ireland, even though, as someone who has never actually been to Ireland, I will be the first to acknowledge this is an overly romanticized, overly trite notion. 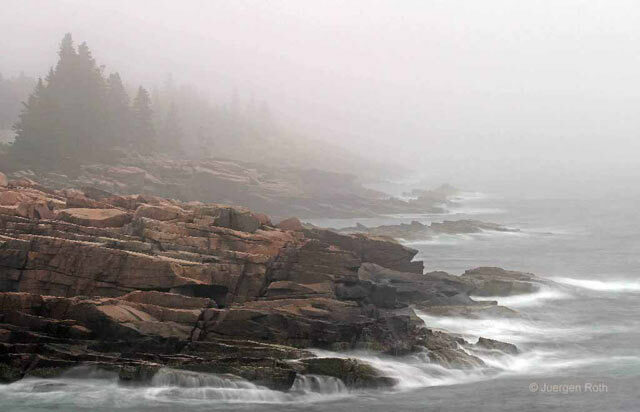 Yet what drives me to make this connection is that the Maine I am thinking of is not the tourist-trapped lobster-state, but rather the fog-swathed, wide-skied coast, whose nights are edged with salt, the low croon of foghorns and the memory of unpeopled rocks. This is, in my mind, somehow similar to the Ireland I have heard described to me, although I would have to visit to truly find out. A few taps upon the pane made him turn to the window. It had begun to snow again. He watched sleepily the flakes, silver and dark, falling obliquely against the lamplight. The time had come for him to set out on his journey westward. Yes, the newspapers were right: snow was general all over Ireland. It was falling on every part of the dark central plain, on the treeless hills, falling softly on the Bog of Allen and, further westward, softly falling into the dark mutinous Shannon waves. It was falling, too, upon every part of the lonely churchyard on the hill where Michael Furey lay buried. It lay thickly drifted on the crooked crosses and headstones, on the spears of the little gate, on the barren thorns. His soul swooned slowly as he heard the snow falling faintly through the universe and faintly falling, like the descent of their last end, upon all the living and the dead. Although as readers we are viewing this scene directly through one of Joyce’s characters, and are thus, arguably, more displaced from it than if the narration were third-person omniscient, the pure poetics still elicit chills instead of the wry, dry satisfaction of mental chess. Thus, even as Dubliners pushed me out of my comfort zone and forced me to become a more analytical reader, it also touched me in ways that were more emotional than intellectual. Though secretly I am not a very critical reader, and enjoy most books, Dubliners remains one of my favorites. With all this said, I am still aware that my connections to my own Irishness are tenuous, and perhaps mostly contrived or coincidental. A cynic could observe that The Lovesong of J. Alfred Prufrock and Hamlet left as deep an impact on me as Dubliners, that I have spent most of my life ignorant of my nick name’s Irish roots, or that I never met my Irish grandmother–and he would be right. I am not trying to claim that my own Irish blood has played an especially formative role in my upbringing; rather, I am trying to mark the places where my genetic origins have intersected with my life. This line of thought, besides being convenient fodder for a class blog post, or an interesting intellectual exercise, has made me reflect that my sense of family is neither as dilute nor as unmoored and nationless as perhaps I first thought. I won’t argue that this has made me feel closer to my family, or even closer to my own origins; but perhaps it does allow me to climb a little more securely into the poetry we are reading, to recognize and validate my own relationship to these poems. There you are. I can say to them. There you are. There are small parts of you, your notions of melancholy, your raspy notes and stone shores, that run into me. This entry was posted in 2011 by allewis. Bookmark the permalink. The resemblance between the North Eastern Coast of North America and the coasts of Scotland and Ireland really is striking– Nova Scotia is called “New Scotland” because the Scots who settled there found it very similar to their homeland: more trees, perhaps, but the same kinds of craggy rocks, storms from the sea, foggy days. There is still, by the way, a significant population of Gaelic speakers on Cape Breton Island.